When former two-time world cyclocross champion Sven Nys lined up for the 2016 Singlespeed CX World Championship (SSCXWC) in Portland, OR, the cyclocross community at large let out a collective gasp. For as long as racers have been lining up for them, singlespeed races have been seen as somewhat of a sideshow in many racing circles. While there are undoubtedly many fast, competitive riders that participate, there’s also no shortage of costumes and beer hand-ups. But now one of the fastest people ever to grace the sport of cyclocross was lining up at the biggest singlespeed event in the world. Did that mean that singlespeed cyclocross was on the path to legitimacy? Or was Sven just finding a way to pass the time in his retirement? We’ll have to see what happens as this year’s season gets started, but for now, let’s take a look at this oddball offshoot of cyclocross racing. The simplest explanation of singlespeed cyclocross is that it’s racing cyclocross on either a singlespeed-specific or a converted singlespeed bike. A more nuanced explanation is that, for those ditching their gears, it’s an entirely different mindset — at least during the cyclocross season. It’s a way to simplify cyclocross racing, to challenge themselves in new ways on the course, and to inject a little more fun into their suffering. Many SSCX events involve at least one person racing in some sort of costume and beer hand-ups are ever-present. Cheers from spectators take on a slightly different form — that of friendly heckling with no hard feelings. Why the Heck Would Someone Give Up Their Gears?! 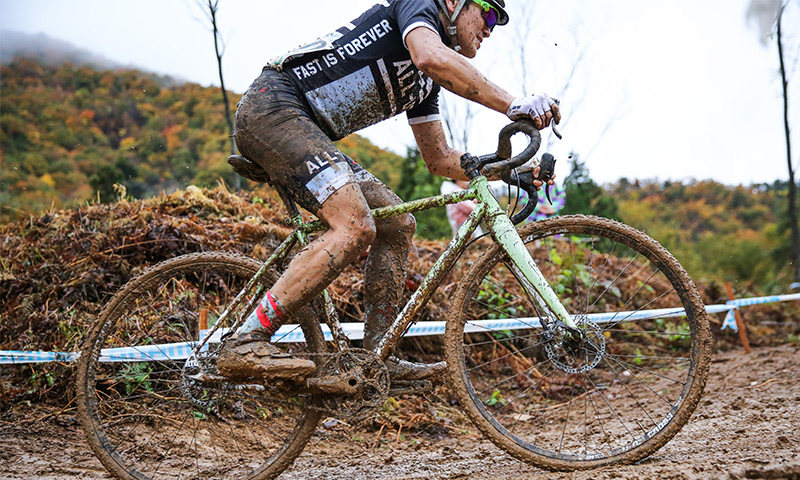 Anyone that’s raced even one cyclocross race knows how difficult it can be… and that’s with gears! Why in the world would someone choose to make something that’s already extremely hard even more challenging? A singlespeed is a snap to maintain. Additionally, since there are fewer moving parts, there are fewer things that actually can snap. The fear of a derailleur hitting the deck in muddy conditions is a thing of the past with most singlespeed set ups. When it comes to singlespeed racing, it’s not just the bike that’s simplified though. The entire atmosphere surrounding SSCX is less focused on competition and more focused on having a good time. Most riders aren’t thinking about their power outputs or whether they’re going to get upgrade points that day. There’s a general air of celebration surrounding singlespeed events (due in large part to the aforementioned costumes, beer swilling, and heckling). In essence, riders are left with less to think and be stressed about. That’s not to say that singlespeeders aren’t competitive, though. There are absolutely those that take it just as seriously as racing at the elite level. However, the general attitude in singlespeed events is undeniably more relaxed than many of the other fields you’ll find racing throughout the day. For some, racing singlespeed can actually double their cyclocross season. In many local cyclocross scenes, there’s typically a dedicated singlespeed race at some point during the day’s events. That means a rider could race their category race and the singlespeed race. Plus, it’s pretty common for additional races to only add five or ten dollars onto the day’s registration fee. If you just want to dip your toe in the mud with regards to SSCX, the best way to do so is with a conversion of your current cyclocross whip. This way you’re not committing yourself to the singlespeed lifestyle (yet). There are a few ways you can accomplish this, with varying results. The first — and easiest — way is to simply zip-tie your shifters so you don’t have the ability to shift them. This method is a little limiting as it really only works with SRAM DoubleTap shifters. The advantage of this method is that it requires the least amount of commitment, and is the easiest to go back and forth between if you only have one cyclocross bike and plan on doing multiple races. However, depending on your local scene’s rules, this method may not be legal — particularly in a higher-level event like a state championship race. When in doubt, check with your local USAC or governing body officials. Additionally, if your local scene runs the singlespeed race with say, a Master’s category, the fact that your bike still has a full 10- or 11-speed drivetrain will most certainly confuse the other singlespeeders and could in turn give you an unfair advantage. And that’s just not cool. The second conversion method is to tighten the limit screws on your rear derailleur and use it as a chain tensioner. Then, just throw a single cog with a spacer kit on your rear wheel and race. This method is typically more acceptable with race officials, though some may make you disconnect your derailleur cable just to make sure. Again, this method has the advantage of being fairly easy to switch between a geared and single set up. Of course, this method only works if you’re starting with a 1x setup. If your bike is already set-up 2x, you’ll also need to either disconnect or ditch the front derailleur. It should also be noted that thin steel cogs can cause damage to an aluminum freehub body. To avoid this, we recommend Surly singlespeed cogs, which have a 4.5mm thick base that won’t dig in to your freehub. If after racing with one of these methods for a bit, you’re feeling like committing more, it might be time for the third method: the dedicated chain tensioner. By using a product like the Surly Singleator, the Paul Components Melvin, or the Problem Solvers Two-Pulley Chain Tensioner, you can ditch the rear derailleur and shifter setup all together. This option keeps you more committed to singlespeed racing so if you plan on racing multiple races in a day, you’ll want a second geared bike for your category race. Of course, you can always race a category race on your singlespeed as well. If chain tensioners aren’t your thing, maybe an eccentric bottom bracket is. Both Problem Solvers and Wheels Manufacturing offer great eccentric bottom brackets that allow you to run a super clean singlespeed set up. They work by rotating the bottom bracket and crank forward ever so slightly to keep tension on the chain. This eliminates the need for any sort of tensioner hanging off the derailleur hanger and is the surest conversion method to keep things from snapping off in muddy conditions. While it’s rare, if mud is thick enough, it can snap your derailleur hanger with a chain tensioner set up. This isn’t the case with an eccentric bottom bracket. If you’ve decided to fully commit yourself to the one-gear way of life, it might be time to invest in a dedicated singlespeed cyclocross bike. Within the QBP portfolio of brands, both All-City and Surly offer models with singlespeed capabilities. The All-City Nature Boy (both cantilever and disc brake options) and Nature Boy 853 are excellent models for those looking for traditional performance cyclocross geometry. Features like a Whisky Part Co. carbon fork on the 853 edition keep the weight down and give the rider a competitive advantage. Both the Surly Straggler and the Cross-Check can easily be set up singlespeed thanks to their horizontal and semi-horizontal dropouts. The Cross-Check is best paired with Surly Hurdy Gurdy chain tensioner to keep the rear wheel from slipping forward in the dropout under the pedaling power that cyclocross requires. The advantages of having a dedicated singlespeed bike are plenty if you find yourself really enjoying racing SSCX. For starters, when it comes to the Nature Boy, it was designed specifically for singlespeed cyclocross. There’s no derailleur hanger and the only cable routing you’ll find on it is for brakes. This eliminates places for mud to build up and makes for slightly more comfortable shouldering. And since you’re not running a rear derailleur or chain tensioner of any sort, there’s no risk of having to throw in the towel because of a snapped derailleur hanger. Additionally, your dedicated SSCX bike will be legal to race in every singlespeed race. Many singlespeeders travel to races with a plethora of cogs to choose from based on the day’s course. The truly dedicated will arrive a few hours early to pre-ride the course with a few different cogs to see which gear ratio is going to be most effective on that particular course. The amount of climbing, sand, and mud are all major factors that play a role in deciding the best gear. This method offers the ability to really dial in the perfect gearing for a given course, which could provide a leg up to the racer. For instance, someone who runs the same gear all season might be at a disadvantage on a hilly course compared to someone who geared specifically for that particular course. The drawback of this method is the hassle of carrying around and switching out cogs between practice laps and races. Plenty of singlespeeders decide on a gear ratio at the beginning of the season and stick with it until the end. While this is certainly the more convenient of the two methods, it does pose the potential issue of being over- or undergeared for a given course. Regardless of what school of the thought you subscribe to, the general principles of gearing are the same. Most amateur racers choose a 38–42t chainring up front and somewhere between a 17–20t cog in the rear. This offers an abundance of possible gear ratios to choose from and while there are factors that play a role in determining the proper gearing, it ultimately comes down to personal preference. Generally speaking, a gear ratio above 2 to 1 is a good place to start, but the gearing you settle on will depend on what kind of rider you are (power vs. spinner) the course, and the conditions. As singlespeeders say, no matter what gearing you choose, you can be sure it will be wrong at least part of the time. Hopefully all of this singlespeed nerdery has given you some inspiration to try it out this season. Most local cyclocross scenes (including yours probably!) have a singlespeed race built into their schedules. Give it a shot and see what you think. Many a cyclocross racer has never looked back to geared races after trying singlespeed a couple times. When you feel like your legs (and liver) are ready, you can head to SSCXWC and see if you have what it takes to get the winner’s tattoo. Who knows? You might even find yourself lining up next to a former world champion.